1. 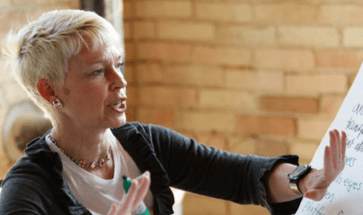 Carol Coletta on why cities need to embrace change. We publish Carol Coletta’s remarks to the Congress for the New Urbanism, outlining the case for thinking about cities in a more dynamic fashion. There’s a temptation in much urban dialog to hope for stasis: that we can keep cities or particular neighborhoods just as they are. But there’s simply too much technological, economic and demographic change for that to happen, and trying to stand still can deprive cities of the opportunity to both adapt to and benefit from ongoing changes (which is how they’ve always thrived in the past). In particular, Coletta argues that achieving our goals of promoting equity hinge on making cities the kind of dynamic, thriving places that capitalize on these changes. Together, the city and the market let large groups of people cooperate by discovering new ideas, sharing them, and learning from each other. The benefits can show up as a new design for a coffee cup or wages for a worker that grow with experience acquired in jobs with a sequence of employers. 3. The Nobel Prize and Cities, Part 2: William Nordhaus. The co-recipient of this year’s economic prize was environmental economist William Nordhaus. 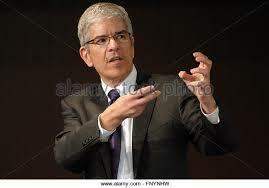 His work has focused on the role that carbon taxes could play in speeding our response to ongoing climate change. Carbon taxes would send subtle and pervasive signals to producers, consumers and investors and which actions would be most effective in reducing emissions, and would prompt the kinds of technological improvements and behavioral changes that we need to avert the adverse effects of global warming. As we’ve argued before at City Observatory, we’re willing to undertake similar measures with obvious local problems, like charging to discourage use of plastic grocery bags; all that’s needed is to expand that kind of solution to a far more serious, global problem. 1. Gentrification and the search for villains. We crave simple narratives for complex problems, and in the process lose sight of important issues. Daniel Herriges, writing at Strong Towns, compares this process to the old parable about the blind men describing and elephant. While it’s tempting to blame developers and new housing for rising housing costs and displacement, the underlying forces driving change are much more deep-seated, and simply attacking perceived villains (as in the case of a recent lawsuit blaming gentrification in Washington DC on the city’s to stimulate the local creative economy) only obscures our understanding of the real causes, and diverts attention from policies that might actually make a difference. 3. The lingering economic effects of the housing bubble. Economists Atif Mian and Amir Sufi have written extensively about how mortgage debt fueled the housing bubble of the last decade, and led to the multi-trillion dollar loss of wealth for millions of American families. Their work also pointed to the devastating impact the bubble had on local economies. They’ve recently updated their analysis comparing unemployment rates in the frothiest markets before and after the collapse of the housing markets. The results show how severe and prolonged the damage to local economies has been. Prior to the bubble, there was essentially no difference in unemployment rates between counties that were crushed by the housing collapse. When housing values fell, county unemployment rates went up most, and stayed higher longer in those places where housing values collapsed most severely. 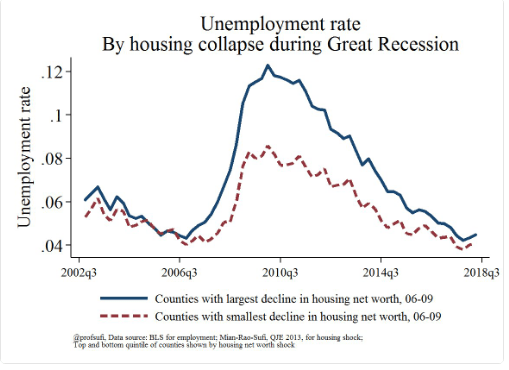 At their peak, unemployment rates were much higher (12%) in these housing collapse counties) than in counties with stable housing markets (8%) Only now, more than a decade later, are unemployment rates in these counties approaching the levels seen elsewhere in the country. Using Facebook to measure connections between places. Last month, The New York Times Upshot reported on new research using big data to track personal connections between places. Researchers used anonymized Facebook data to look at the pattern of connections between different counties in the US based on Facebook Friends. The Times has produced an interactive map that lets you click on any county in the US and see which other counties have the strongest ties to that county. The key data point is how many more (or fewer) friend-pairings there are between counties than one would expect based on the population of the two counties. The following map shows places with disproportionately high numbers of friend-relationships with persons living in Wayne County (Detroit) Michigan. Proximity plays an important role: most ties are to adjacent or nearby counties, and usually in the same state. What’s more fascinating is the pattern of less proximate ties. Detroit, for example, has strong ties to the rest of Michigan, but also a network of ties that reach into the mid-South, reflecting both historical connections (The Great Migration) and the current geography of the automobile industry.